EXCLUSIVE! The leafy tip of a branch reaches for the sun, leaves unfolding when they meet the light. A reminder that each new twig adds to the majesty of the tree. 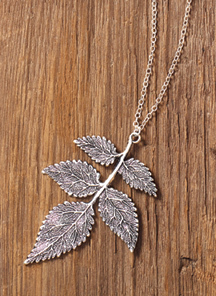 Silver-plated leaves on extra-long 36" chain. Handmade in Spain.